“Welsh travel outfitter Freerein arranges self-guided trail riding in the moors of Mid Wales"
Take a look at the mugs, bags, t-shirts, hoodies and water bottles all available to buy from our brand new Freerein Gift Shop. 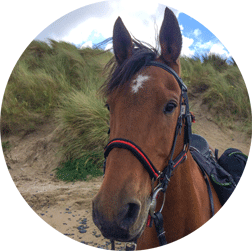 Get a Freerein Gift Voucher made to your chosen amount, emailed to you as a PDF and redeemable on any holiday with us. Here at Freerein we welcome riders, old and new, to explore the wilds of Wales on our fit, friendly, and forward going horses and ponies. Whether you choose a self-guided, guided or learn to ride horse riding holiday, we look forward to welcoming you here at Freerein. If you have any question or queries please do get in touch. If you are looking for a different type of gift, why not a Freerein Gift Voucher? Purchase any amount, they are redeemable against any holiday. Use our quick trail finder tools to find the right riding holiday for you. Our holidays are unique; you can’t ride self guided anywhere else in the UK or the USA. We are a relaxed, friendly and professional trail riding centre. Operating since 1989. 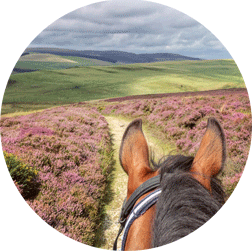 Our trail riding network is located in Mid Wales – UK’s finest trail riding country. Knowledgeable & professional staff who have a passion for trail riding, the outdoors, horses & people. To learn to ride a horse is one of the best pastimes you can think off, especially for those who fancy some awesome fresh air far from the hustle and bustle of a busy life. Joining a famous horse riding holidays tours or break is a fete in its own right and you can get the most out of it any time you want to. Freerein is the place where riders, novices and professionals alike explore the Welsh wild on some of the fittest and most friendly forward going ponies and horses. The guides are informal, relaxed and highly experienced as you revel at one of the most beautiful yet varying scenery, country lanes free of traffic, old green roads and hill tracks as well as open spaces fit for canters. Trail riding offers a horse holiday great for every novice and beginner even if it is for a weekend only. Every new rider is introduced to a whole new world of riding towards the hills with the aim of making every rider comfortable with the horse while enjoying being in a saddle travelling along great trails and tracks. Those with a limited or zero experience with horses can soon learn how to have their horses prepared for the appealing trail by learning how to catch, groom, feed and tack the horse up. The course is very practical with the learning taking place in the scenic hills, making it the perfect backdrop to introduce a person, a family member or friend who has never ridden to great horse riding holidays and horseback travel pleasures. Guidance and instruction offered is very casual, friendly and relaxed while the Freerein horses are the most understanding and patient. After the end of a trail ride, lots of riders usually gain all the confidence they need to get out there and engage in self guided trail riding expeditions. There are also welcoming Welsh country inns along the trails to make your horse riding adventures a success; en suit rooms are provided as great chefs keep the cuisine coming in a great atmosphere and backdrop for after trail beverages for some of the most excellent cider and ale. As you get down to a trail ride, it is important to ensure you have learned all about looking after a great horse such as the one you are using. This involves checking hooves, catching, tacking up, feeding and grooming. Tacking up involves learning how a bridle is put including the saddle, saddle bags and numnah. At the saddle, you learn all you can to control the hose at a walking pace as you lead it down and up some of the steepest slopes, remounting and dismounting until you have completely got it. You can progress in your horse riding from a simple trot to a couple of canters days later. It is also important to indicate that route finding lessons are also provided, particularly for any self guided trails to be done in the future. 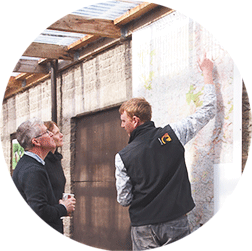 Learning how to use Freerein route descriptions and maps will definitely come in handy. There is a lot of scenery in Wales and so many ways to ride you are spoilt for choice. Some gallop by the beach, canter across high cliffs as some cruise the mountains and pass by woodlands. It will be the best shortbreak you will ever have on a horse. 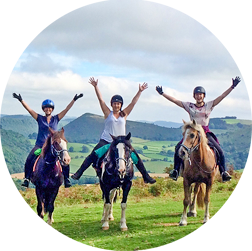 Welsh horseback riding escapades are some of the best way of enjoying the rich beauty of the country as fertile valleys, rolling hills, grassy knolls and mountain slopes open before you. The farmhouses and villages nestled within the hill country folds in, blending seamlessly with the scenic environment. Hedgerows and fields will be spread before you as you cruise the ridges. Riding in this part of the world begins moderately as one learns all about the horse and the topography of the land, riding across grassy greens paths and leafy lanes. The farms and small villages will warmly welcome you as they dot the Welsh countryside while the landscape will be the source of a lasting charm, exciting history and immense variety. You will find all kinds of horse riding holidays to choose from for basically every rider, from the expert to the novice and anything in between. The trail riding in the region are world class and worth trying for a couple of days and even much more to enjoy a wonderful horse riding experience that you might not forget any time soon. You will find most of the riding holidays with day long and half day horse rides, meals and accommodation to allow you concentrate on riding without worrying about anything else. It is always fulfilling to be able to venture out into some of the far-flung destinations around Freerein with some of the most stunning and remote landscapes keeping you company with lunch in a saddle bag. You get to ride up to the highest place to encounter some of the most dramatic panoramas and vistas or simply harness your horse riding skills by taking riding lessons or engaging in some of the diverse horsemanship clinics offering specific instructions you might be looking for. Even as you continue grasping the skills to mastering a horse and putting all your effort to learn to ride a horse, remember there are simple etiquette rules for riders of all kinds, from the expert to the novice to remember before hitting the trail for the safety of the riders and their horses. Among all the rules perhaps the most important is the one that requires maintaining at least a horse’s length between the next horse and yourself while following the same trail. It essentially gives every person time and room to react in a safe way if the need be in case of an accident or in case a quick stop is required. It is always important to study the animal and be alert to the horse you are riding and what it is doing at any given time. In fact, the breathtaking countryside is one worth enjoying but controlling the animal is also important. You must always remain aware of the other riders and horses you are riding together with. In most cases, unruly horses will always remain at the back while some are very spirited and might act up if they have no experience of the current trail you might be on. Most importantly, always ride your horse to the level of the novice in the group at a pace these inexperienced individuals are comfortable with while picking trails that even a novice can navigate confidently. If there is something to always remember, it is the fact that horseback riding has everything to do with staying centred and balance. The horse must always remain in good balance no matter your discipline, whether you are a trail rider, event rider or a dressage rider. Proper balance is very important for effective riding since the centre of the rider’s balance has a direct effect on the balance of a horse. Before you start riding your horse request a person to stand behind the horse and see if the seat lies within the dressage saddle centre for every seatbone to be equidistant with the saddle’s middle. In case the seat is not in the centre of the saddle, the rider will collapse around the waist and shoulders will not be level and the balance will be chaotic. Above all, the Welsh horses, are fit, fine and beautiful and capable of surprising riders with their superb balance and sureness of feet. They are strong, intelligent and compact, naturally suited to the mountains and hills that surround the Welsh countryside. The terrain is also diverse and includes picturesque country paths, thick forests and open moorlands as well as narrow yet beautiful mountain ridges. Your horse riding holiday in the area is a perfect opportunity for fast gallops and speedy canters and perhaps a perfect chance to jump ditches and logs if you want to. Whether you came as a novice or just a good rider, you will learn to be very comfortable at a canter, trot and at a walk. General horsemanship courses will leave you comfortable at catching your horse, tacking it up and grooming it. 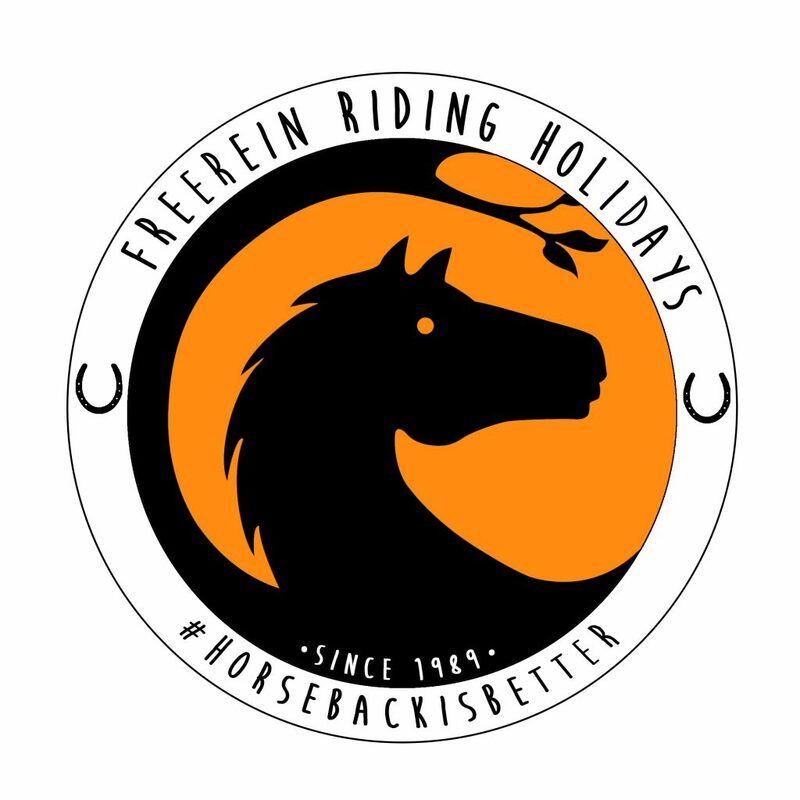 These are unique Freerein riding holidays offering a unique experience and fun for everybody. Please choose one of the following options that best suits your enquiry. 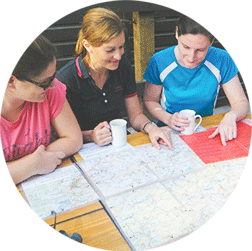 Use our quick trail finder tool to find the right riding holiday for new customers. Use our quick trail finder tool to find the best trail for existing customers. If you’d like to check availability or trails on specific dates, just let us know. Use our quick trail finder tool to find the right riding holiday for you.